I’m constantly surfing the net looking for ideas and visual stimulation, and even more so when a home project comes up. I’m a great collector of paintings, favouring those done by my very talented family members, but occasionally I’ll find a print that I like, or take the bold step of shopping at an art auction. Of the two, in my opinion, framing and block-mounting prints are by far the less expensive option. I have some old favourites I’ve collected over the years which get updated with new frames from time-to-time, but I also enjoy visiting galleries and art shops to browse posters of new artists. I can have a Renoir, a local folk artist and a contemporary landscape hanging on my wall at any time for a fraction of the cost of the original. One of the benefits of posters is their size – an impressively large print can fill a wall with sophisticated style without costing much. So, flat colour and a small library of paintings is how I prefer to decorate my walls – moving paintings and prints around as seasons, and life-stages of my family evolve. Not everyone’s cup of tea, as I discover when my young-adult daughters move into their garden flat. One wants to use her walls as giant pin-boards to be able to display her study materials, while still looking bohemian-classy (is there such a thing?). The other is a neat-freak who will settle for only a hard-edge floral wall decal that must look just so. My first fabulous find was frame-mounted fabric. Shop for offcuts of the newest curtain and upholstery fabric, mount them on canvas stretchers (simply a wooden frame), securing the edges with a staple gun, and hang them around. The benefits include making cushion covers of the same fabric, or even a designer teddy-bear. Lamp-shades, book covers and table runners too. 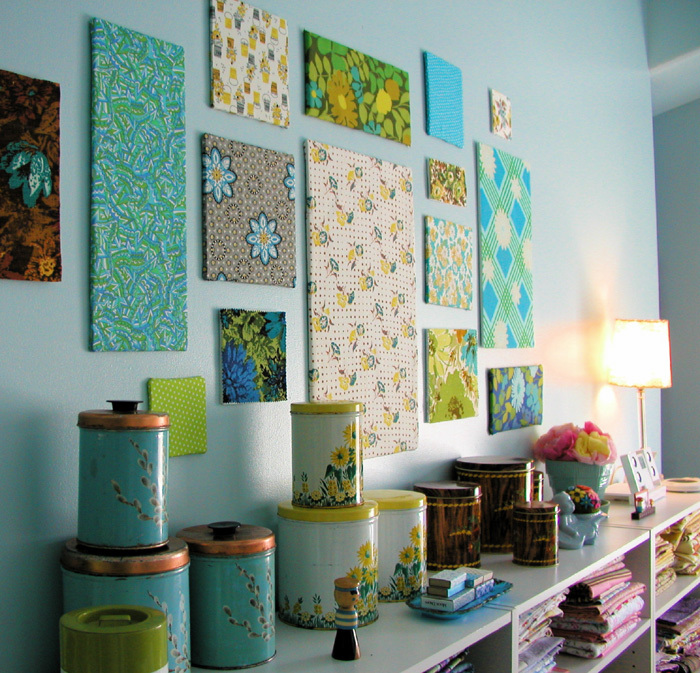 A slightly more practical variation – use your gorgeous fabric to recover old pin-boards or cork-boards. This creates a good-looking pin-board area that naturally curbs the impulse to stick study notes directly onto the wall. And if your budget allows, it can be fabulous to have a blown-up photograph printed onto canvas to hang on a wall, or to make a screen out of. The key here is versatility for multi-purpose spaces that can also be consistently personal in its style. The next revelation was stencilling. I immediately got nervous – candy-stripes can dominate a small room and make it feel crowded. But we began with simple candy stripes – a neutral mushroom onto an off-white wall. We masked the edges with masking tape after measuring out the stripes, and checked the straightness with a spirit level. The painting part was quick – we used small foam rollers. Then, on top of that can come the floral decals. We looked at a couple of options with decals. Popular on the market at the moment are the vinyl decals that you just peel and stick. They are generally suited for a small space to accentuate a zone or frame a piece of furniture. There is a variety of designs on the market, from wind-blown vines, to perky little trees, and calligraphic quotes of your choice. You can even get them custom designed and laser-cut. But we wanted to go for something over-sized, and budget being the ultimate decision maker – we went back into the garage to find paint, selected a flower silhouette from a clip-art library, and traced the image onto the wall using a data projector. The challenge then is getting the edges right – a nice flat, smoothed-bristled brush from my studio. Then came the question: how do we decorate the girl’s common spaces? A kitchenette, corridor and bathroom that they share needed a character that both could enjoy, while remaining practical. The bathroom was fairly easy – they needed storage. We mounted some shelves, and stacked them with storage boxes of various kinds covered with wrapping papers all of similar colours. They will need re-wrapping in a couple of years, but by then the girls will be ready for a colour scheme make-over in there. The corridor – also pretty straightforward. We gathered together as many old photo-frames as we could find, spray-painted them black, and mounted a variety of photos of family and friends. Nowadays, you can easily buy an inexpensive digital camera and either print the photos at home or order the pictures online at low cost.